Home > VARIOUS AREAS > SPOT > Planning for a great day trip from Kyoto? Planning for a great day trip from Kyoto? Kyoto is one of the biggest tourist draws in Japan and so many foreign and domestic tourists stay here. However, if you want to see areas outside of Kyoto there are still many places you can go on a short trip to visit. Himeji is a castle town situated West of Kyoto along to coast of Hyogo. Himeji can be easily accessed from Kyoto station, simply take the shinkansen and it will only take around one hour to reach Himeji. Situated in Himeji is a beautiful castle, widely considered at one of Japan’s best. Surprisingly in Japan, unlike many other castles, Himeji was not destroyed in wars, fires of earthquakes. Thanks to this luck you can see the original castle as it has been since it was built! Due to this it is not surprising that Himeji castle is a world heritage site. Himeji castle was originally constructed in the 14th century when a keep was built here by one of the clans who ruled the region. Since then varying clans have enlarged the castle until 1609 when it took its current form. The castle is known as “White Heron” due to the covering of white plaster on all of its walls. For just 1000 yen, you can access the castles itself, or for an extra 40 yen you can also visit the nearby Kokoen Gardens which are beautiful. See a bit of surviving Japanese living history by visiting Himeji. Nagoya is the fourth most populated city in all of Japan, with over 2 million people in residence! During the Edo period, Nagoya was developed as a castle town under the Owari, one of the branches of the Tokugawa family. Sadly much of the buildings in Nagoya were destroyed during the Second World War, however there is still a lot to see and do in the capital of Aichi Prefecture. Nagoya Castle has been beautifully reconstructed in its original position. In 1959 the castle keep was rebuilt in ferroconcrete and is surrounded by moats and corner turrets. Work began in 2009 to rebuild the castle’s palace, which was also destroyed in air raids. These works as still ongoing and are expected to be complete in 2018. For now you can enter the scaffolding and have a look at the building works. Other interesting attractions in Nagoya including a Railway Museum, showcasing the evolution of the Shinkansen and other trains of Japan. There are many other museums in Nagoya, such as a Science Museum, Tokugawa Art Museum and a Toyota factory. Travelling by Shinkansen from Kyoto it only takes 30 minutes or so to get to Nagoya, so it a really quick trip! Hiroshima is very famous outside of Japan as being the victim of one of the two atomic bombs landed in Japan. Hiroshima is the principal city of the Chugoku region and has over a million residents. 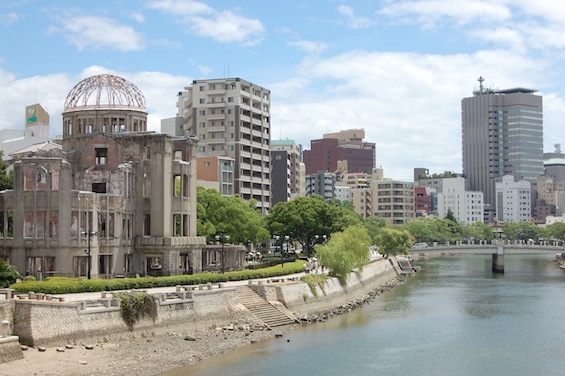 Many people thought that Hiroshima would be uninhabitable after the bomb, however, the brave people of Hiroshima rebuilt the city to its former glory. The Hiroshima Peace Park is a big tourist draw from people to visit Hiroshima. It can be a really humbling experience to see the A-bomb Dome below the centre of the explosion to truly understand the devastation it caused. However there is a hopeful note by visiting here, hope that this will never again be repeated. Hiroshima castle has been beautifully restored and reconstructed after its destruction. The keep itself is five floors tall and is surrounded by a moat. You can go inside the castle and visit the museum detailing the history of the castle and get a beautiful view across the city. There are also many beautiful gardens and shrines around Hiroshima to visit, and great shopping and food too! If you are staying a little longer in Hiroshima then visit Miyajima, the iconic torii gate in the water. If you are based in Kyoto for your stay in Japan there are many side trips you can take to enjoy other aspects of Japan. ・Get lost in Nagoya: castles, shrines, museums and more!